Since its publication by Sierra Club Books in 1977, The Unsettling of America has been recognized as a classic of American letters. 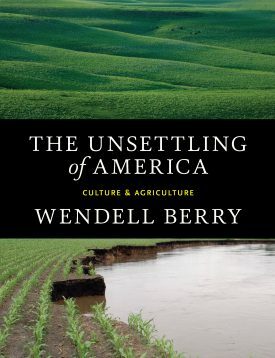 In it, Wendell Berry argues that good farming is a cultural development and spiritual discipline. Today’s agribusiness, however, takes farming out of its cultural context and away from families. As a result, we as a nation are more estranged from the land — from the intimate knowledge, love, and care of it. Sadly, his arguments and observations are more relevant than ever. We continue to suffer loss of community, the devaluation of human work, and the destruction of nature under an economic system dedicated to the mechanistic pursuit of products and profits. Although “this book has not had the happy fate of being proved wrong,” Berry writes, there are good people working “to make something comely and enduring of our life on this earth.” Wendell Berry is one of those people, writing and working, as ever, with passion, eloquence, and conviction. WENDELL BERRY is the author of more than fifty books of poetry, fiction, and essays. He was recently awarded the National Humanities Medal, the Cleanth Brooks Medal for Lifetime Achievement by the Fellowship of Southern Writers, and the Louis Bromfield Society Award. For more than forty years he has lived and farmed with his wife, Tanya, in Kentucky.